Paintings and tapestries of still lifes, allegories, landscapes, market scenes. Many show readily identifiable edible species. Reference: België op de wereldtentoonstelling van de jacht (catalog). Budapest. Aug.-Sept., 1971. Medium: Oils on canvas; size: 168 x 140 cm. Reference: Ember, I. Delights of the Senses. Budapest: Museum of Fine Arts. 1989. Medium: Oils on canvas; size: 42 x 58 cm. Reference: La natura morta in palazzo e villa. Ed. Sillabe, 1998. Medium: Oils; size: 121 x 152 cm. Reference: Catalog PIASA. Paris. June 6, 2000. Reference: Werbematerial Auktionshaus. Bonn: A. Bödiger. 1999. Medium: Oils on canvas; size: 152 x 244.3 cm. Medium: Oils on canvas; size: 45.7 by 56.5 cm. Medium: Oils on canvas; size: 78.7 x 55.6 cm. Medium: Oils on wood; size: 49 x 63.5 cm. Mushroom description: Four Boletus pinophilus. The hymenial surface of the foreground left mushroom seems to be moldy, perhaps an early stage of Hypomyces chrysospermus which is a frequent fruitbody parasite of boletes. Medium: Oils on canvas; size: 94 x 107 cm. Note: At least nine Goessaert paintings on this theme are known. It seems likely that mushrooms are also found in some of them. Medium: panel; size: 35.5 x 51 cm. Reference. : De Jonckheere. Tableaux de Maîtres Flamands et Hollandais des XVIe et XVIIe Siècles. 1991. Reference: Lempertz-Auktion, Alte Kunst, Katalog 526. Medium: Oils on paper; size: 25.4 x 34.9 cm. Medium: Oils on canvas; size 77 x 88 cm. Medium: Engraving; size: 15 x 20.5 cm. Medium: Oils on panel; size: 39 x 58 cm. Reference: Brück & Sons. Meissen. 1995. Medium: Oils on canvas; size: 120 x 170 cm. Reference: Greindl. 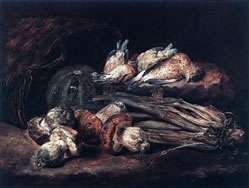 E. Les Peintures Flamands de La Nature Morte aux XVIIe siécle. Sterrebeek. 1983. 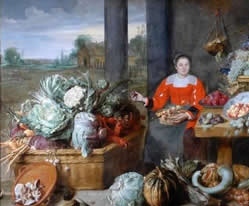 Note: Copy with modifications of Frans Snyders, Fruit and Vegetable Stall, q.v. Medium: On copper; size: 18.5 x 26 cm. Reference: Galerie Robert Finck, Bruxelles. Collection de tableaux anciens du XVè au XIXès. Nov. 19, 1976. No. 25. Medium: On copper; size: 11.8 x 15 cm. Mushroom description: Brown mushrooms looking like boletes but gilled! Reference: Christie's, Old Master Pictures. Amsterdam, 13-11-1990. Medium: Oils on panel; size: 15.5 x 22 cm. Reference: La natura morta a palazzo e in villa-Le collezioni dei Medici e dei Lorena. Sillabe, Florence. Medium: Oils on canvas; size: 34.5 x 31.5 cm. Medium: Oils on canvas; size: 127.2 x 103.2 cm. Reference: Sotheby’s Auction. Hammer Price with Buyer's Premium. Medium: Oils on canvas; size: 65.1 x 109.3 cm. Medium: Oils on canvas; size: 186 x 136 cm. Mushroom description: Basket of Agaricus campestris? Medium: Oils on canvas; size: 64 x 92 cm. Medium: Oils on canvas; size: 64 x 101 cm. Medium: Oils on canvas; size: 61 x 108 cm. Reference: Wasson, G. and V. Mushrooms, Russia, and History. NY: Pantheon Books. 1957. Schneider. Stilleben. Cologne. 1989. Robels. Snyders. Munich. 1989. Note: Copy is in Schloss Pommersfelden, Germany, and a variant is in the Louvre. Reference: Robels. Snyders. Munich. 1989. Medium: Oils on canvas; size: 160 cm x 252 cm. Medium: Oils on canvas; size: 15 x 35 in. Reference: Warner, R. Dutch and Flemish Flower and Fruit Painters of the XVIIth and XVIIIth centuries. Second ed. Amsterdam: BM Israel NV. 1975. Medium: Oils on canvas; size: 182 x 291.5 cm. Reference: Ader Picard Trajab, Paris, 22-06-1990, fig. 47. Reference: Le musée du potager. Ed. Réunion des musées nationaux, 1998. Medium: Oils on canvas; size: 152 x 179 cm. Medium: Oils on canvas; size: 68 x 86 cm. Reference: La peinture florale du XVIe au XXe siècle. Ed. du Credit Communal, 1996. Medium: Oils on canvas; size: 36.8 x 40.7 cm. Reference: Communicated to D. Thoen in 1987 by Robert S. Marks. Medium: Oils on panel; size: 64.2 x 48.5 cm. Reference: Magie et Sorcellerie en Europe du Moyen Age à nos jours. Ed. A. Colin. Paris, 1994. Gentlemen by a Fountain (Les Cavaliers à la fontaine). Tapestry woven in the 17th century after a sketch drawn by David Teniers II. Mushroom description: Women selling fruits and vegetables; a basket of brown mushrooms in a stall. Medium: Oils on copper; size: 54 x 68.5 cm. Mushroom description: Upper left corner: five mushrooms with brown caps and white, claviform stipes mixed with fruits. Reference: The European Fine Art Foundation (TEFAF), Maastricht 1997. With figures by J. Jordaens (see Jordaens). Mushroom description: Fishermen with fish and trays of various foods, including a plate with approximately 12 mushrooms. Hard to tell if gilled mushrooms or boletes. Reference: Forty. Meisterwerke der Malerei. Augsburg. 1999. Medium: Oils; size: 200 x 320 cm. Mushroom description: Basket of Agaricus? Location: Phillips. The International Fine Art Auctioneers. UK. Medium: Oils on canvas; size: 71.5 x 97 cm. Reference: Auction, Dorotheum, Lot No. 194, October 5, 2005. Medium: Oils on panel; size: 60 x 104 cm. Medium: Oils; size: 135 x 218 cm.